Some people under eat before a workout in the hope that the body will use fat rather than food as fuel, resulting in higher muscle definition. This is a very bad idea. Rather than burning fat, this will simply mess up your metabolism and can encourage the body to burn muscle stores in the place of food energy. A truly effective workout needs to be fuelled, so be sure to have a healthy, sensibly sized meal a couple of hours beforehand. Persistent under eating before workouts will result at best in poor performance, and at worst is likely to leave you a skinny wreck rather than the muscular, fat-free machine you were hoping for. 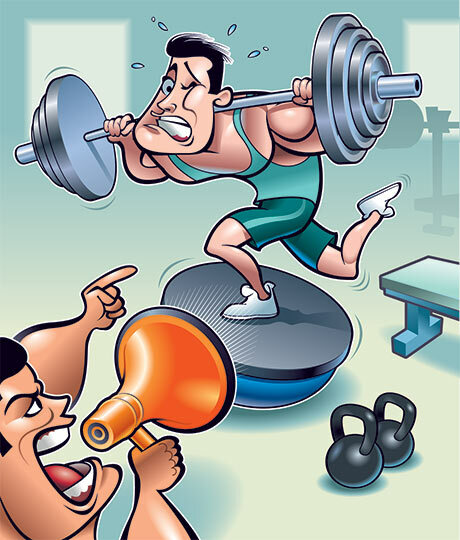 Working out on an empty stomach can cause dizziness and plummeting blood pressure, both of which are dangerous in any environment, let alone a gym. Not to mention the huge impetus the body will have after the workout to replace the fats and sugars it so desperately needs. When you’re weak with hunger and aching muscles, it can be hard to resist the call of unhealthy foods, especially when your body and brain are desperately telling you that they need those carbs! Trying to ‘sweat out’ excess weight to get down to certain weight classes for competitions, or even just to trim down for muscle definition can be a dreadful mistake. Working up a sweat to purposely dehydrate can cause cramping, lowers performance, and has longer lasting effects than you might expect. Research shows that excessive sweating is also a bad idea for those with prematurely thinning hair. The lactic acid in sweat has been proven to break down the layers of the hair shaft, leaving it brittle and prone to breaking. Sweating to dehydrate also puts considerable pressure on internal organs – particularly the kidneys, which are irreplaceable once they begin to fail. Cramping is a big problem brought on by sweat-induced dehydration. Sweating alters the balance between salts and electrolytes at a cellular level, causing cells to swell and stick to the calcium of the bones. This results in agonizing cramp, and fixes the muscle contraction in place. Bodybuilders have been frozen in position due to this, which does not provide the powerful and dignified impression they were hoping for! Taking in lots of protein may seem like a good idea – muscle is protein, so it would seem that more protein will ultimately equal more muscle. Up to a point this is true. However, there is often a misunderstanding that protein consumption is half the work when it comes to muscle building. In fact, extra protein helps to solidify the work you’ve already done in the gym. Some people are prone to trying to bulk up on protein rather than putting in the hours at the weights – which is a very bad idea. There is a limit to the amount of protein the body can absorb, especially when excess protein is not being built into well-worked muscles. The liver cannot break down large amounts of protein daily, so too much protein over a sustained period of time can be very bad for your liver. Excessive amounts of protein in the bloodstream can also cause irreversible damage to the kidneys, and even tax the heart muscle. Of course, the amount of protein a person can safely consume massively varies depending on age, weight, metabolism, and physical activity, so ask a dedicated sports nutritionist for a personalized recommendation on this issue. The key to avoiding many of these mistakes is not to overdo it. Of course you should train intensely and push your body to its limits – so long as you give it time to recover. If you overload your body beyond its capacity, you’ll just find yourself frustrated at your lack of progress, and perhaps even make yourself ill. Instead, work on increasing that capacity at a sustainable rate. If you treat your body with the respect it deserves, you will find that it rewards you with impressive results!